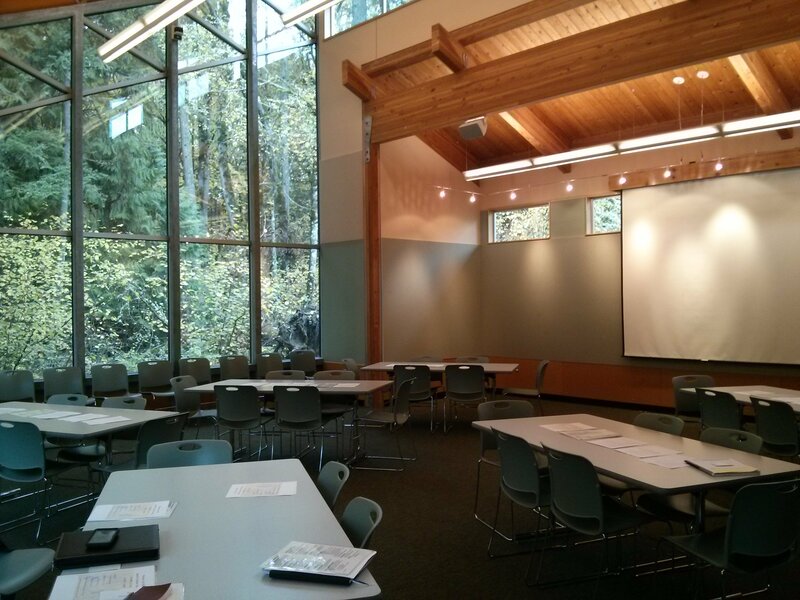 Located on the edge of the Tualatin Hills Nature Park's oak woodland, the Tualatin HIlls Nature Center offers a large meeting and banquet room (Beaver Den) and a smaller room (Robin's Nest) for rent when programs are not in session. The rooms boast vaulted ceilings, natural woodwork, and large windows that look out into the forest. Whether you want ambiance for a private party or serenity for a business meeting, we have all the amenities to make your event successful. For reservations or more information, please contact Nature Center staff at 503-629-6350. The Beaver Den is a wonderful room for meetings, parties, or other activities. We offer room setup including tables, chairs, microphone, and stereo. The room also has wi-fi and sound equipment for your presentation needs. The Beaver Den is approximately 29 by 31 feet and comfortably seats up to 50 people. This room has direct access to our courtyard space, providing your guests an opportunity to enjoy nature. This room rents for $98 per hour, plus $100 security fee. Two hour minimum. This room is perfect for small group meetings, programs, and children's birthday parties. This room can hold a maximum of 20 people. Its approximate size is 23 feet by 16 feet. Room rental includes tables and chairs. The Robin's Nest is available in the evenings and on weekends when programs are not running. This room rents for $60 per hour, plus $100 security fee. Two hour minimum.